There are many options when it comes selecting a lacrosse stick. Please reach out to your level coordinator if you have questions that are not answered in this guide. Grades 1-4 should use a stick 37 inches in length. Grades 5-8 should use a stick 40 inches in length. Grades 5-8 Defensive players should talk to their level coordinator before purchasing a defensive shaft. Sticks can be purchased strung or unstrung from your local lacrosse supplier or online. 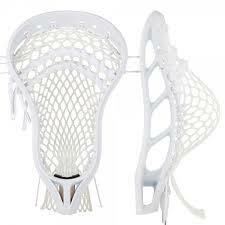 A strung stick can be a good entry level option if the mesh is not too hard. 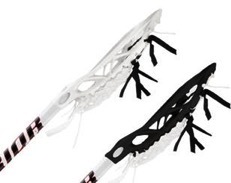 An unstrung stick will give you the ability to have the stick strung to the players liking. Most advanced players should be using a custom strung stick. All sticks should have a Low or Medium pocket. Over time a lacrosse stick will become disformed due to the natural stresses of the game of lacrosse. Your pocket and strings will need to be replaced overtime. We recommend restringing your stick with new mesh every year. Please ask your level coordinator to inspect your stick if you have questions about its performance. If the coaches determine your child’s mesh is unsuitable, expect they will tell you or your child that they need to have it restrung. WE CANNOT STRESS HOW IMPORTANT THIS PIECE OF EQUIPMENT IS FOR PLAYER DEVELOPMENT! A good resource is https://stringking.com/ustring/ They have online videos showing you step by step how to string your stick. You will have to create a free account but this site will show you how to string your specific stick. Helmets need to be purchased separately. In general the Cascade and Brine series of helmets are very good, and fit a wide variety of heads; it is up to the players comfort level which brand they choose. Cascade Helmets are available through our website in the online store for a discounted price. ANY helmet, whether a new purchase or hand-me-down, MUST be NOCSAE approved for use. Players without a NOCSAE approved helmet (you can find this designation on a sticker on the inside or outside of the helmet) will likely be asked to sit out during games. US Lacrosse is very strict about this as it is a player safety issue. Protective cups and mouthguards are not sport-specific and can be purchased at any sports retailer. Tricon Sports in Lexington has many options of both. Please send your child equipped to play a fast-paced sport on a variety of slippery surfaces, both natural and artificial. Many surrounding towns have natural grass fields which can be slippery, even when dry. Artificial turf can be very slippery when wet. In general, soccer or football cleats can be worn, but lacrosse-specific cleats work best. Baseball cleats or running shoes are not appropriate; baseball cleats are not designed for quick cuts and lots of running, and running shoes lack proper traction and lateral support. Please ensure that your child’s footwear is secured properly. Coaches spend a lot of time tying or retying footwear at practices and games, which cuts down on time spent with other athletes. The staff at Tricon, or any major sports store can help you determine the proper choice for your child. LYL has secured team pricing at both Tricon Sports in Lexington, and through Sportstop.com, an online lacrosse specialty store based in New Hampshire. Tricon has everything that new or younger players will need and should be your first choice.